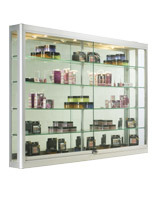 Best Selling Display Cabinets Include Many Styles and Sizes! 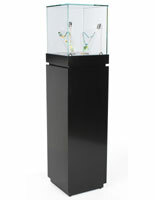 TrophyCasesNow.com features a complete collection of discounted trophy cases in our online catalog. Having been in business for over 35 years, we know what customers want. 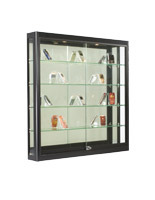 These trophy cases are popular with our customers. They are the models purchased most often. What makes a trophy case a client favored? 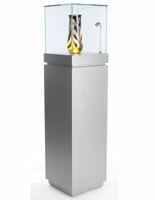 As you can tell by the variety of best selling display cabinets for trophies, there isn't just one favorite showcase model. These trophy cases, also known as awards showcases, include tower cases, wide cabinets, pedestal style units, and wall mounts. They are top of the line units and economy models. 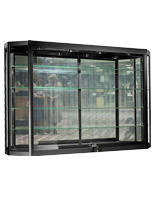 These trophy cases are equipped with the features that customers want. What features? That depends on the customers! These trophy cases are large and small, lighted and non-lighted. They have hinged doors and doors that slide open. These display cabinets all showcase exhibited merchandise with style. Peruse this entire category to see if any of the best selling display cabinets will work for your home or business. Don't forget to check out our entire catalog to see all of our showcases that exhibit your trophies, awards, and collectibles in style! How should you choose a trophy case? 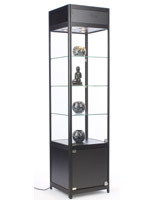 The first consideration when purchasing a display cabinet for awards and trophies is to look at the space in which the cabinet will rest. 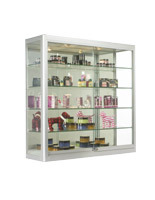 Do you have a large room that can handle a wide display cabinet? Or do you have a smaller room that requires a narrow showcase? 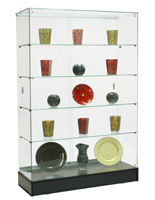 Buying a display cabinet too big or too small for the room will diminish the effect of the display. So, the best thing to do is measure the space you have for exhibiting and look for a display cabinet with the dimensions that fit into that area. Then, check out the rest of the furniture in your home or business to be sure that the showcase will easily blend into your current setting. Another consideration is style. 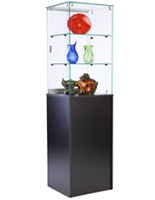 If you have a modern décor, then you want to choose a more modern display cabinet for trophies. If you have a more conventional décor, you will want to choose a model that has more conventional lines. Our Howard Miller collection is an example of more conventional showcases that are used in homes and upscale settings. Our Grace Tyler collection is an example of more modern showcases that are used in commercial settings. Color is another feature that is important. A black, white, or silver model will fit in with most modern decors and you don't have to worry about matching the finish with your furniture. They may even blend well in a conventional décor depending on the styling. 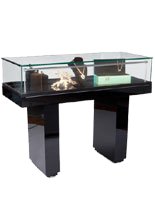 Check the many finishes if you want your new showcase to match your existing furniture. With the many wood grain finishes available, you are certain to find the right coloring for your home, office, school, or retail institution. A final consideration has nothing to do with looks, but with mobility. 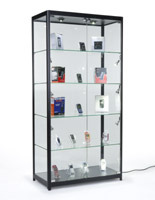 If you intend to purchase a showcase that will sit in one spot, you don't have to worry about mobility. However, if you are the type of person that routinely rearranges furniture in a home or uses temporary displays in a retail showroom, you may want to consider purchasing a model that is mobile. 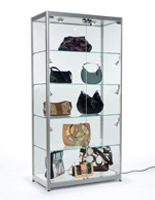 If one of our showcases is equipped with wheels or casters, it will say so in the product description.